A word of caution- As of now, the ROM only supports the Snapdragon variant of the Galaxy J7 (SM-J700P), while support for the Exynos and dual-sim variants may very well be on the way, readers are advised to exercise caution and identify their device model before flashing the ROM on their device. Note: Kindly ensure you’re running the J700PVPS1AQD1 firmware for the Galaxy J7. You can download it from here and flash it via Odin. Download the desired 7.1.2 Nougat ROM mentioned above. 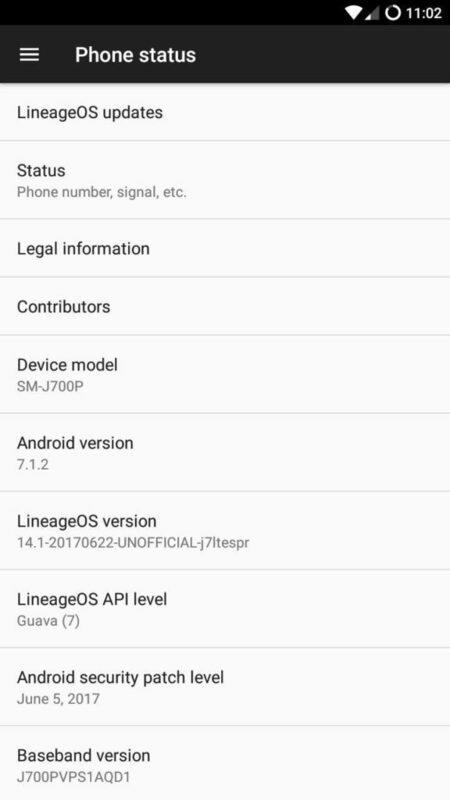 If you wish to root your device, download Lineage SU from the prerequisite section. Transfer all your files to the root of your internal storage. Now, reboot Galaxy J7 (SM-J700P) device into TWRP recovery. Select Backup and perform a full Nandroid backup of previous ROM. Tap on Wipe and format partitions including Cache, Dalvik-Cache, Data, System. Tap on Install and select the ROM from storage. Swipe to install ROM. Install Gapps in a similar manner. Wipe the cache and reboot your device. Note: The current ROM is still in alpha and may not be stable. One known bug in the ROM being include In-Call Audio issues. It is recommended to wait for a stable build if you use this device as a daily driver.